To Cite: Farshadzadeh Z, Modaresi M H, Taheri B, Rahimi S, Bahador A. In Vitro Antimicrobial Activity of Dermcidin-1L Against Extensively-Drug-Resistant and Pandrug-Resistant Acinetobacter baumannii, Jundishapur J Microbiol. 2017 ; 10(5):e13201. doi: 10.5812/jjm.13201. Background: Acinetobacter baumannii is currently considered one of the greatest causes of nosocomial infection. The rapid emergence and spread of resistance to most conventional antibiotics highlight the need to identify novel antimicrobial agents. Antimicrobial peptides (AMPs) are introduced as potential therapeutic alternatives. Human anionic antimicrobial peptide, dermcidin-1L (DCD-1L), has shown antimicrobial activity against a wide range of nosocomial pathogens; however, it is still unknown whether it exhibits such properties against A. baumannii. Objectives: For the first time, the present study was conducted to examine the antimicrobial activity of DCD-1L against biofilm-forming extensively-drug-resistant (XDR) and pandrug-resistant (PDR) isolates of A. baumannii, belonging to different clonal lineages. Methods: Dermcidin-1L was examined in terms of antimicrobial properties against 1 biofilm-forming representative XDR isolate from each clonal lineage and 1 PDR isolate via minimum inhibitory concentration (MIC) and minimum bactericidal concentration (MBC) analyses and time-kill assay. Dermcidin-1L resistance mutation frequency in A. baumannii was also determined. Results: Minimum inhibitory concentration and MBC of DCD-1L against all 8 representative XDR and standard (ATCC 19606) isolates were 16 and 32 µg/mL, respectively, while the corresponding value for 1 PDR isolate was 8 µg/mL. The time-kill assay results revealed that the bactericidal effects were more rapid against PDR than XDR strains. In addition, the tested AMPs showed a low tendency to develop resistance. Conclusions: The present results showed that DCD-1L exhibits interesting antibacterial properties against PDR A. baumannii strains, making it a promising candidate for the development of new antiinfective therapies. Copyright © 2017, Jundishapur Journal of Microbiology. This is an open-access article distributed under the terms of the Creative Commons Attribution-NonCommercial 4.0 International License (http://creativecommons.org/licenses/by-nc/4.0/) which permits copy and redistribute the material just in noncommercial usages, provided the original work is properly cited. Acinetobacter baumannii can cause a variety of nosocomial infections, ranging from pneumonia to serious blood, brain, or wound infections in hospital settings (1). Traditionally, Staphylococcus aureus and Pseudomonas aeruginosa are recognized as the most dominant pathogenic microorganisms in burn units. However, recently, A. baumannii has become one of the most prevalent pathogens in burn intensive care units (2). Recently, an increasing trend in multidrug resistant (MDR) and extensively drug resistant (XDR) isolates of A. baumannii has been documented (3, 4). The last-line treatment of infections caused by XDR strains currently entails administration of colistin, which leads to the development of strains resistant to all other antibiotics, ie, pandrug-resistant (PDR) strains (2, 4, 5). Consequently, these bacteria can cause truly untreatable infections, thereby presenting a challenge to the treatment of infections and indicating the need to develop new therapeutic strategies. Antimicrobial peptides (AMPs), involved in the human immune system, are considered the principal therapeutic candidates (4). Due to their broad-spectrum antimicrobial activity and low tendency to develop resistance, AMPs appear to be an appropriate antibacterial agent to overcome antibiotic resistance threats (4). As part of the constitutive innate immune defense of human skin, the dermcidin-derived peptide, DCD-1L, shows antimicrobial activities against several nosocomial pathogens, and unlike the majority of AMPs, its activity persists over a broad pH range and at high salt concentrations (4); therefore, DCD-1L appears to be a promising candidate for antimicrobial drug development (6). So far, a number of studies have investigated several cationic AMPs for their antibacterial activity against A. baumannii; however, no studies have evaluated the anionic peptide, DCD-1L. The present study was conducted to investigate the antimicrobial activity of DCD-1L against biofilm-forming XDR and PDR strains of clinical A. baumannii isolates from different clonal lineages. A total of 100 clinical A. baumannii isolates were collected from burn wound infections from September 2013 until February 2015 at Shahid Motahari referral burn center in Tehran, Iran. The initial and final identification of bacterial species was performed using the API 20NE system (bioMérieux, Marcy-l’Etoile, France) and multiplex polymerase chain reaction (PCR) with gyrB-directed primers (Macrogen, South Korea), respectively, as described in the literature (7). To select the strongest biofilm producer with an XDR or a PDR phenotype in each clonal lineage, antimicrobial susceptibility, biofilm formation, and clonal lineage were determined by disc diffusion method (8), crystal violet staining assay (9), and multiplex PCR, respectively, as described in the literature (9, 10). All the isolates were assigned to MDR (nonsusceptibility to at least 1 agent in 3 or more antimicrobial categories), XDR (nonsusceptibility to at least 1 agent in all except 2 or fewer antimicrobial categories), and PDR (nonsusceptibility to all agents in all antimicrobial categories) phenotypes, according to the international expert proposal for interim standard guidelines (11). The present study was designed according to the ethical standards of the declaration of Helsinki and was approved by the Ethics committee of Tehran University of Medical Sciences (92-03-30-23186). The DCD-1L peptide (purity ≥ 95%) was purchased from Proteomics international laboratories (Proteomics International Laboratories Ltd., Australia). The MICs of DCD-1L and colistin (Sigma, USA) were determined on planktonic cultures, using the broth microdilution method, as recommended by the Clinical and laboratory standards institute (CLSI) with slight modifications (8). In brief, A. baumannii cultures were diluted in fresh lysogeny broth (LB; Merck, Germany) overnight to achieve a final density of 5 × 105 colony-forming unit (CFU)/mL; then, they were added to 96-well polypropylene microtiter plates (SPL Life Sciences, Gyeonggi-do, Korea), containing 2-fold DCD-1L dilutions, ranging from 256 to 0.5 μg/mL. The results were recorded after incubation at 37°C for 24 hours. The MIC was described as the lowest concentration of peptide, resulting in no visible bacterial growth after 24 hours. There were 3 replicates of each test sample. In addition, MBC was described as the lowest concentration of peptide reducing the viability of the initial bacterial inoculum by ≥ 99.9% (12). In the current study, time-kill assay was carried out to evaluate the killing rate of DCD-1L in comparison with colistin (Sigma, USA) as the last-resort antibiotic. For each strain, a ﬁnal density of 107 CFU/mL, which was prepared from overnight cultures, was added to the 96-well microtiter plates (SPL life Sciences, Gyeonggi-do, Korea) in the presence of DCD-1L and colsitin at 1 × and 4 × MICs. The antibiotic-free control was included for each strain. Viable counts were performed after incubation at 37°C for 0, 0.25, 0.5, 1, 2, 4, 5, and 24 hours. Each sample was serially diluted and added to Mueller-Hinton (MH) agar (Merck, Germany). The lower limit of detection in time-kill assays was 2 log10 CFU/mL. All tests were performed in triplicate and repeated twice. The resistance mutation frequency of A. baumannii against DCD-1L and colistin was assessed by adding the bacterial suspension (108 CFU) to MH agar (Merck, Germany), containing the test peptide at 4 × MIC. Viable cell count was performed by serial dilution on drug-free agar plates. After 48 hours of incubation, the mutation frequency was estimated by dividing the number of CFUs on treated plates by the number of CFUs on untreated plates. To affirm the development of resistance mutation, MIC tests were performed for all resistant mutants. The effect of DCD-1L toxicity on the mitochondrial activity of human embryonic kidney (HEK)-293 cell line was evaluated by 2, 3-bis (2-methoxy-4-nitro-5-sulfophenyl)-2H-tetrazolium-5-carbox-anilide (XTT) assay (cell proliferation kit II, Roche, Germany). The cytotoxicity of peptide was measured by the ability of cells to reduce the yellow XTT to orange formazan in the presence of various concentrations of DCD-1L, as described in the literature (13). Statistical analysis was performed by student t test, using SPSS version 22. P value less than 0.05 indicated statistical significance. In order to determine the MICs of DCD-1L and colistin, the strongest biofilm producers with an XDR or a PDR phenotype were selected in each clonal lineage. Nine representative clinical strains from 9 clonal lineages (Table 1), as well as a reference strain (A. baumannii ATCC 19606), were examined in the next experiments. Abbreviations: ACB, Acinetobacter baumannii; G, PCR-based group; MBC, minimum bactericidal concentration; MIC, minimum inhibitory concentration; PDR, pandrug resistant; XDR, extensively drug resistant. The type of G clonal lineage did not exhibit significant effects on the susceptibility of isolates to DCD-1L (P > 0.1). The MIC of DCD-1L against all representative XDR strains from different clonal lineages was 16 µg/mL (Table 1). The MBC of all XDR isolates was 1 dilution greater than the MIC. The estimated MICs and MBCs showed that PDR strains were more susceptible to DCD-1L, compared to XDR strains (MIC = MBC = 8 µg/mL). The results of time-kill assays of DCD-1L and colistin against A. baumannii strain 3 (ACB-3) (Figure 1A) were identical to those against 7 clinical XDR strains and the standard strain, ATCC 19606. The results of time-killing assay against ACB-3 at 1 × MIC (16 µg/mL) of DCD-1L exhibited approximately a 2-log reduction in the viable count; regrowth was observed after 24 hours. 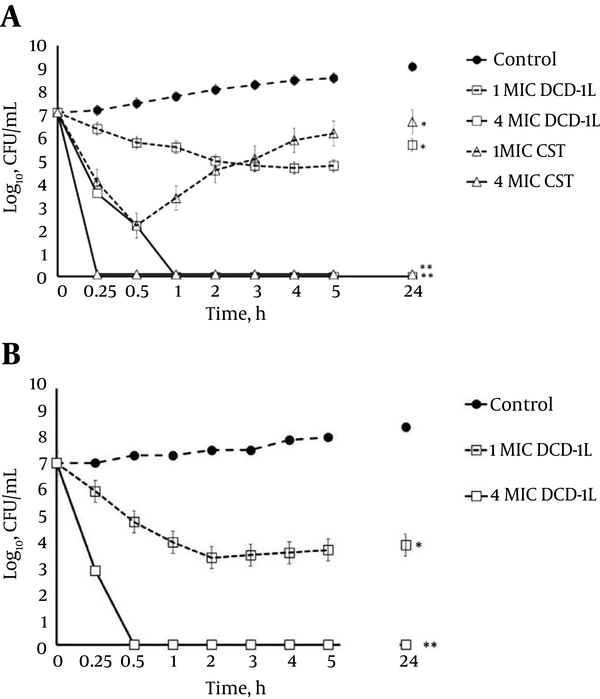 A, concentration-dependent killing of XDR A. baumannii by DCD-1L and colistin (CST); B, concentration-dependent killing of PDR A. baumannii by DCD-1L and colistin (CST). All data represent mean ± standard error of the mean (SEM) of 3 independent experiments (*P < 0.001; **P < 0.0001). At 1 × MIC (0.25 µg/mL) of colistin, a 5-log reduction in the bacterial inoculum was obtained within 0.5 hours; however, fast regrowth was observed after 1 hour. At 4 × MIC, the bactericidal activity of both agents was fast. Dermcidin-1L and colistin at this concentration exhibited a 7-log reduction within 1 and 0.25 hours, respectively. These results revealed that DCD-1L and colistin have similar killing activities at higher concentrations. Moreover, the time-kill assay was performed against 1 resistant colistin (PDR) isolate, ACB-31, to assess the killing rate of DCD-1L. As presented in Figure 1B, treatment of this isolate with DCD-1L at 1 × MIC (8 µg/mL) led to approximately a 3-log decline in viable counts with regrowth at 24 hours. On the other hand, at a higher concentration (4 × MIC) of DCD-1L, a rapid decline was observed in the colony count of PDR strain (a 7-log decrease within 0.5 hours). These results showed that DCD-1L had a rapid bactericidal activity against the PDR strain, compared to XDR strains. Dermcidin-1L concentration of up to 100 µg/mL had no significant effect on the viability or morphology of HEK cell line. The absorbance measured after incubation in the presence of different concentrations of peptide (20, 40, 80, and 100 µg/mL) was not significantly different from the control. Recently, use of colistin, as a crucial last-resort option, has increased in the treatment of patients with infections caused by XDR strains. If colistin resistance spreads to bacteria, which are already resistant to other antibiotics, it can result in a PDR phenotype and the bacteria can cause untreatable infections (14); these findings underscore the urgent need to develop novel therapeutic alternatives. Dermcidin-1 is a human anionic antimicrobial peptide with a broad range of antimicrobial activities (15). The antibacterial activity of DCD-1L against A. baumannii was evaluated for the first time in the present study. Based on the findings, the effect of DCD-1L on PDR strains was greater than XDR strains. Evaluation of the susceptibility of representative XDR strains from all clonal lineages with high biofilm-forming capacity revealed that the antibacterial activity of DCD-1L was not influenced by biofilm-forming capacity and was not significantly different among clonal lineages; this could be considered an appropriate property for an antimicrobial candidate. A number of studies have investigated several cationic AMPs for their antibacterial activity. Ge et al. reported an MIC50 of 2 mg/L and an MIC90 of 8 mg/L for pexiganan, as an analog of magainin, against MDR and XDR A. baumannii (16). In another study on PDR strains, the MICs of FF/CAP18, an analog of LL-37, ranged between 8 and 16 µg/mL (12). In the present study, evaluation of DCD-1L for its antimicrobial activity against the colistin-resistant (PDR) strain revealed the susceptibility of this strain to the tested peptide; in other words, resistance to colistin, as a cationic peptide, did not influence susceptibility to DCD-1L, as an anionic peptide. These findings are in agreement with the proposed mechanism for DCD-1L by other researchers (4, 6). According to the finding of previous studies, since the antimicrobial activity of cationic AMPs is governed by electrostatic interactions between the positive and negative charge of the bacterial surface, bacteria frequently develop resistance mechanisms towards cationic AMPs by reducing the net negative charge of the bacterial surface. However, the anionic peptide, DCD-1L, represents an important exception to this rule. The activity of DCD-1L is not influenced by reducing the negative charge of the bacterial cell envelope, since interaction of this peptide with negatively charged phospholipids of the membrane (to form ion channels across the membrane) is stabilized by a zinc ion bridge (6, 15). Therefore, unlike cationic AMPs, the activity of DCD-1L is not influenced by reducing the negative charge of the bacterial cell envelope. This property indicates that DCD-1L has evolved to evade the resistance mechanisms of cationic AMPs, which could be considered a promising advantage for a potential therapeutic candidate. In the present study, the time-kill kinetic assay was carried out to evaluate the bactericidal potency of DCD-1L against A. baumannii. Comparison of the killing kinetics of DCD-1L and colistin, as a last-resort antibiotic, against A. baumannii revealed regrowth for both antibacterial agents at 1 × MIC, although regrowth was observed at a lower rate for DCD-1L. Selective amplification of a subpopulation with less susceptibility could be an explanation for regrowth in the presence of low-concentration colistin (17). This finding is in agreement with previous time-kill kinetic assays of polymyxins (17, 18). Following treatment with higher concentrations of DCD-1L and colistin, rapid bactericidal activities were observed against A. baumannii, which could be a promising property in combating severe infections. Therefore, DCD-1L could help limit infections by potential pathogens in the first few hours following bacterial colonization. For an effective treatment, the incidence of resistance to DCD-1L should be low. The colistin resistance mutation of A. baumannii occurred at a high frequency, whereas no spontaneous DCD-1L-resistant mutants of A. baumannii could be recovered. In summary, the present study revealed that DCD-1L has rapid bactericidal activities against XDR and PDR A. baumannii and a low propensity to progress in resistance. The susceptibility of colistin-resistant strains to DCD-1L provides evidence that DCD-1L peptide evades bacterial resistance mechanisms with respect to the characteristics of cationic AMPs. Based on these findings, DCD-1L appears as a promising candidate for the development of new antiinfective therapies. Due to the presence of proteases in the human body, oral administration of DCD-1L may appear irrational. As part of the constitutive defense system of human epithelia, DCD-1L may help prevent local infection of pathogens by modifying surface colonization (19). In this context, the potential of DCD-1L in topical treatment of burns and skin infections cannot be ignored. The authors would like to thank Motahari hospital for the assistance in collecting the isolates. Authors’ Contribution: Abbas Bahador and Zahra Farshadzadeh proposed the original idea. All authors developed the protocol and abstracted and analyzed the data. Zahra Farshadzadeh and Behrouz Taheri wrote the manuscript. Funding/Support: This study was extracted from a PhD thesis and was funded by Tehran University of Medical Sciences (health services grant No., 92-03-30-23186).